Agreed. When you put those bike splits in the context of the rest of their races, they're very impressive. lol, I hope you're wife doesn't log on to ST! A Speedmax can't use a keyboard, so he's safe there! Is it just me or perhaps Frodo is just really that tall.....but that looks like a 650c rear wheel somehow. Surely not? Are you stalking me? I didn't say the integrated front of the giant looked fugly, I was commenting on the overall look of the bike. Just doesn't do it for me. The Canyon looks much better to my eyes. Is that ok with you? Your fugly comment was a reply to a point I made on that thread, a point about how I like the integrated front end hydration trend that we are starting to see (I gave the the Canyon as an example) but that I realise that some people find this trend ugly. That's why I remembered it. "I think that this style of integrated front end hydration and bento will become the new norm. You only need to look at the new Canyon, new Cube, and now this Giant to see the trend forming. Personally I like the look and utility of them, and so am happy with the way things are going. A lot of people find them ugly though." You're obviously entitled to whatever opinion you want re: bikes or basically anything else, I just found it weird that you were talking about how nice the front end looked just a day or two after proclaiming them fugly. Didn't see your original comment, and for the last time, I wasn't commenting on just the front end. Not sure why you keep bringing that up. To me the Giant is just a weird combination of integrated front end with a P3-like curved rear, while the Canyon just seems more put together as a whole. Pics? Size? Year? 7 series or 9 series? What type of bottom bracket does the new Canyon use? Is it the Shimano pressfit BB86/92 standard? Just want to know if my Quarq Elsa RS GXP crankset would fit with little to no issue. Assuming the Canyon ever comes to America. So all the pics that we have seen of this bike so far have pretty high pedestals for the aerobars. With the integrated storage, it looks good. The pads align with the top of the storage and it l"looks aero".......but it also hides the fact that the storage units are really tall. While the bike gives me hope that it is a "long & low" bike, i wonder what happens when you don't need that much aerobar stack? Aesthetics aside, it seems like there is gonna be a lot of "stuff" hanging out in the wind. I don't see it being a problem for 99% of users. When you consider that there is 5-10cm of height added by the forearms, I think you'd need to have the aerobars mounted under the basebar in order to have the hydration rising significantly above your arms. If this is the case then most people will be able to mitigate this by riding the frame size down and using a longer stem to keep the reach. If you look at the picture of Frodo at the top of the homepage, you can see that he's pretty low and he still has a gap between the top of the hydration and the bottom of his arms. He'd have to be about 15-20cm lower at the front end to start experiencing what you're describing. check it out on instagram BBLOEHRRRR, radioactive yellow, sc, 9, project one, size large (i am 5'11). Like GMAN hoping we see the canyon come to america. First bike i have seen as integrated as the trek, actually more integrated. Not sure if anyone saw it or not. 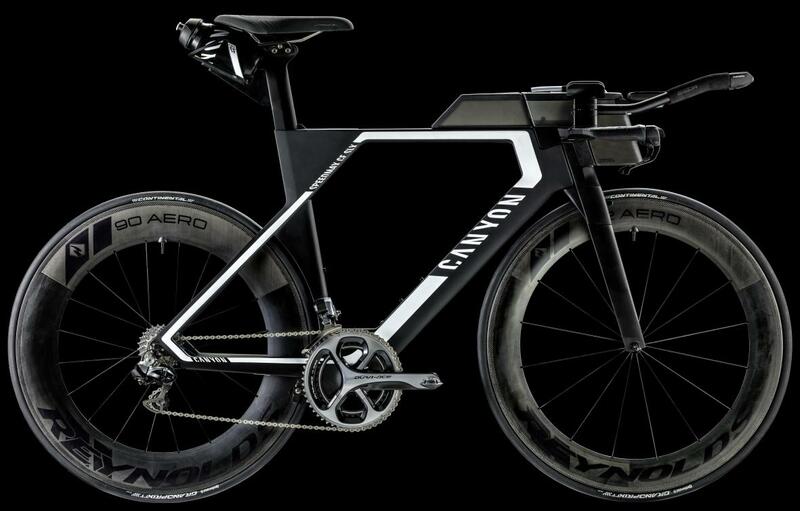 But tririg's post about this bike mentions that Canyon will be selling direct to US customers starting in December. I saw the Tririg post, but couldn't find anything to validate it. From what I can see it's something that they have been working on for a bit. But I guess we will have to wait and see if this comes to fruition or not. There definitely isn't a lack of interest state side. Thats a such a cool image ... state-of-the-sport right there - its like looking at a new age in ironman racing - with no disrespect to previous champions contendors (they were all awesome) - Frodeno is possibly the most professional looking and meticulously dialed in athletes that ironman has seen. Marino, Seb, Macca, Lieto, Badmann and that german guy on the trinity looked the business too. How's it compare aerodynamically to Cervelo P5 and others? I like that they are thinking out of the box with their bike (and their distribution model), but is this really the best they could have done with the shape of its bento? If yes, canyon really needs a bit of help (fyi, we're available). There's no doubt you know what your doing, but, don't you think the angle on the back side of the bento is intended to match up with other angles on the bike? Unfortunately, yes, I do think that that was their intention. An aesthetic goal of some sort. However, a highly aero bike should not necessarily have angles "complement each other". Instead, the angles need to complement only one thing: the air flow near the item in question, i.e., achieving the lowest drag possible around the item and the system as a whole.